DISCLOSURE: I received three products for the purpose of this review. I received no monetary compensation. All opinions expressed herein are my own and based on my own use of and experience with the item(s). I baked a lot of brownies and cakes when Lizz was a kid. But not too much bread. I don't know why... maybe... I didn't think I could do it justice the way Nanie had done. However, I AM baking bread again! Just recently, I was delighted to discover Voila Hallah Egg Bread Mixes. Hallah (or Challah) Bread is the traditional egg bread of the Jewish People. It's braided and baked and served on Shabbat (The Sabbath) and most holidays. According to Jewish tradition, the three Sabbath meals and two holiday meals each begin with two complete loaves of bread. This "double loaf" commemorates the manna that fell from the Heavens when the Israelites wandered in the desert for forty years after the Exodus from Egypt according to Jewish religious belief. The manna did not fall on Sabbath or holidays; instead, a double portion would fall the day before the holiday or sabbath. Each single loaf is sometimes woven with six strands. I don't have a stand mixer, so I made the bread by hand. Because I made it early, I didn't get the pics I wanted. But I will tell you the directions are easy to follow and clearly spelled out! I loved every minute of the process... from proofing the yeast to kneading the dough. Watching it rise gently and then braiding. For me, doing this by hand, connected me to my Mother... and her Mother... and back to the days of Miryam and Ruth... Judith and Elizabeth. This is how it has always been, Mother to Daughter. It's a very intense feeling of family when making bread for those whom you love -- for we do not break bread with our enemies. The bread comes out of the oven and it's so very tempting to dive right in, but I didn't. I waited until Mike got home and we ate every bite of that amazing bread! Our whole grain — wheat and spelt–flours are certified organic, as is our flavoring. Our products are certified Kosher by the Orthodox Union (OU). My favourite is the Traditional Egg Bread Mix. Light, slightly sweet. Just so very good! I think Mike liked the Wholey Wheat the best, though! I'm saving the Simply Spelt for an upcoming special occassion! Tribes-A-Dozen™ offers a diverse line of high-quality, natural baking mixes so that even our busiest follower could create bread with the taste, aroma, and quality expected of a bread made from scratch. WE RESOLVE to forge connections to all people and to the earth that are as straightforward and as warm as a freshly-baked loaf of bread. 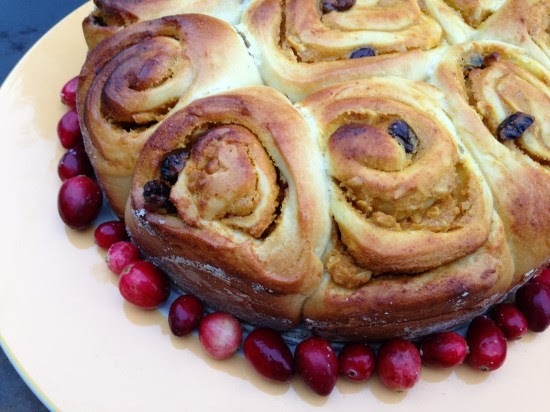 Tribes-A-Dozen has some awesome recipes posted on their blog including this delicious Pumpkin Cheese Babka! You can find Voila Hallah at many stores nationally, just click here for their Store Locator. You can also find them on Amazon.com. You may connect with Tribes-A-Dozen on their Social Media Pages: @tribesadozen on Twitter, Facebook, and Pinterest. The kind folks at Tribes-A-Dozen have generously offered my readers the same great sampler package that I received! I know you'll be pleased! Previous winners of Tribes-A-Dozen giveaways are ineligible. I'd love to try the traditional egg bread. I also want the traditional egg bread. I have heard it is delicious. I'd like to try the Voilà! Hallah Traditional Egg Bread Mix. I would like to try the Wholey Wheat Egg Bread Mix. I would like to try the Traditional Egg Bread Mix. I would like to try Voilà! Hallah Wholey Wheat Egg Bread Mix. I'd love to try the Wholey Wheat! I want to try the Spelt Bread because I have not ever tried that and it is healthy. I'd Like to try the Traditional Egg Bread Mix the most. I'd like to try the wheat variety. I also entered to win the Mohawk Valley maple syrup. I would most like to try the Traditional. The Voilà! 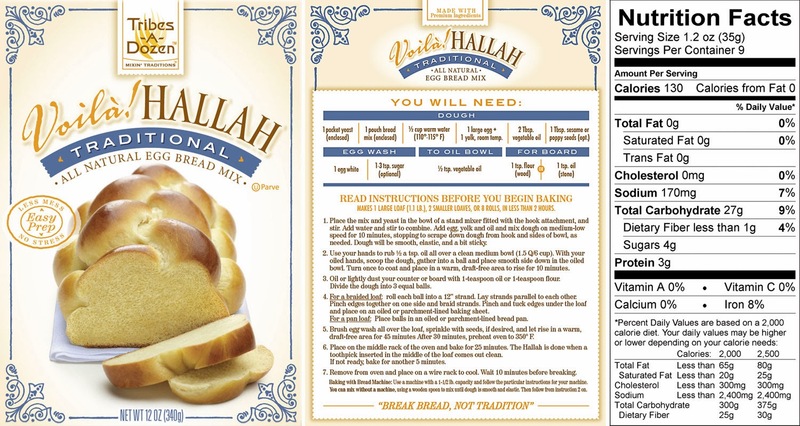 Hallah Traditional Egg Bread Mix sounds like the one I'd like to try. I would choose the traditional bread mix. I would like to try the Wheat egg. I'd love to try the Traditional Bread mix! I would like the spelt mix. I entered your maple syrup giveaway. i would like to try the Voilà! Hallah Traditional Egg Bread Mix. I would like to try the Voilà! Hallah Wholey Wheat Egg Bread Mix. I want to try the Voilà! Hallah Wholey Wheat Egg Bread Mix. I would like the wheat. I would love to try the wholey wheat flavor! I would like to try the wholly wheat egg bread mix and the traditional. I'd love to try the Hallah Holey Wheat! I'd love to try the Wholey Wheat.